I started working as a researcher on business research projects in 2010. One of the topics centered on decision-making and more specifically, the heuristics-and-biases tradition. While looking for literature on biases, I stumbled upon judgmental forecasting. What an interesting field! It combines my love for the decision-making literature with my fascination of modern computational power. It was around that time that I decided to pursue a PhD and consequently, I wrote my PhD proposal on the benefits of combining human judgment with statistical forecasting. The first forecasting paper I read was a draft of the Seifert and Hadida (2013) paper in Organizational Behaviour and Human Decision Processes, on combining judgment and statistical models in forecasting. Seeing this application with field data motivated me to write a proposal focussed on similarly researching judgmental forecasting in organisations. While writing this research proposal, we noticed that there was interest from the business world in this topic. 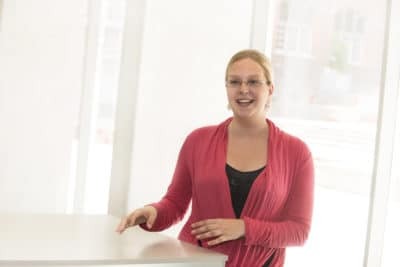 Along with my advisor (Karlien Vanderheyden) and colleagues from the operations and data analytics department, I started a research centre on forecasting within Vlerick Business School. I currently manage the day-to-day business of this centre and am conducting research with its members. I hope to start a post-doc this year, focussed on continuing the work of my PhD topic: forecasting promotions by combining judgmental and formal methods. While my background is in psychology, this topic introduced to me the field of operations research and data analytics. The cross-disciplinary nature of the topic makes it so interesting, but also quite challenging. You need to be a jack-of-all-trades and know different methodologies and applications. There is one experience that has shaped my work. As part of my PhD track, I spent one year studying at a university abroad. I was lucky enough to end up in Nigel Harvey’s lab at University College London. I learned how to code, on my own website and run experiments. The conversations with Nigel were always a pleasure and full of new knowledge. And the second term, I shared an office with Dilek Önkal. Working with these two big names and in the high-performing environment of UCL, got me really hooked on the field and the job itself. Now, I can’t imagine not being a researcher! Well, my background is in psychology and more specifically, in decision-making. I am a fan of both the heuristics and biases approach of Kahneman and Tversky, and the natural decision making approach of Klein. While the former identifies the faults in human decision-making, the latter stresses the potential of for instances, expert decision making. I think that both are perfectly unifiable in my topic! We see that biases occur, yet, people are still able to outperform statistical models in certain situations. I like that there is a balanced view of human judgment. Dilek Önkal’s research is a great example of a positive outlook on human forecaster potential. By providing me with a travel grant so I could attend my first International Symposium on Forecasting. In the first year of my doctorate, I did not have any funding available for attending conferences. The IIF awarded me with a travel grant and I have been coming back to ISF every year since then. It’s always a pleasure to see everyone again. The crowd of judgmental forecasters are such a welcoming group of people. I admit to being a bit star-struck that first time, seeing all those names that I knew from citing their papers! But they all immediately involved me in their conversation and I felt right at ease. I am an avid reader: I always have my Kindle with me and read whenever and wherever I can. In Spring and in Summer, I like to work in my garden and grow my own veggies.